Shop on AmazonSmile and Amazon will donate to the National Society of Professional Engineers Education Foundation! AmazonSmile is a simple and automatic way for you to support the National Society of Professional Engineers Education Foundation every time you shop. And there's no cost to you. When you shop at smile.amazon.com, you’ll find the same prices, same products, and the same shopping experience as Amazon.com, with the added bonus that Amazon will donate 0.5% of the price of your eligible AmazonSmile purchases to the National Society of Professional Engineers Education Foundation. 1 - Sign up: Visit smile.amazon.com. It’s the same Amazon you know with the same products, same prices, and the same service. 2 - Sign in. Simply use your existing Amazon credentials. If you are new to Amazon or if you don’t have an account, you can create a new one. 3 - Start shopping. After you’ve chosen your charitable organization, your shopping experience will be the same as it is on the Amazon website. There’s no extra cost for you at checkout! 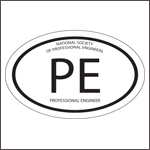 Amazon will donate 0.5% of your purchase to the National Society of Professional Engineers Education Foundation.